These handy reminders build repeat service business. Subtle but effective, these stickers always keep your name in view of your customer. Customized write-on panel arrangements available at no additional charge. Made of transparent static vinyl with white write-on panels. Static is on the backside for use on inside of car windshield. Size: 1 1/2 inch by 2 1/4 inch. Imprint area: 3/4 inch by 2 inch. 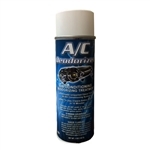 A/C Deodorizer Aerosol Autoscent. Eliminates unwanted odors from all air conditioning systems. Easy to use, cleans entire system in10 minutes. 5oz. Durable easy-to-use design features punched and cleared holes to eliminate mess. Can be write on with pen, pencil or marker. Handy dispenser holds roll of plastic carpet protective film. It's constructed of heavy duty metal and comes with plastic applicator board and instruction diagram. 1 side bonded, 1 side laminate pad. 100 per bag. Each pad measures approximately 15" x 18 ". Strong, completely, plastic Slip-N-Grip brand floor mats provide a solid barrier against dirt, grease and water. Plus, they feature Slip-N-Grip technology to ensure performance and protection while your customer's car is being serviced. They will not shift or bunch up like paper mats and they won't fall apart when wet. These auto floor mats are reusable, disposable and fit all vehicles. Comes in a specially designed box for easy dispensing off the roll. 500 count per box This is an economical answer to protecting floor mats. 500 count. Embossed paper floor mats are each approximately 17 in. x 22 in. with shoe silhouette on the front. They are extremely durable and come in 250 count box. Product imprint is in Black Large BOLD four digit numbers on manila tag stock. Printed Green on Front and Red on the back. Gray Universal Sonic Bonded Pads - Fast acting for quick response with a layer of polypropylene that creates high surface area that enables Sonic Bonded Mat to quickly soak up liquids. High absorbency keeps it on the job longer. A random assembly of large diameter poly fibers creates a lofty layer. Ultrasonic Bond Points keep mat intact by fusing layers of fibers together which keeps the mats shape even when completely saturated. 100 per bag. Each pad measures approximately 15" x 18 ". Absorbency: 20 gallons. Kit includes: Wand, Super Wedge and Air Wedge. Safely allows entry into most vehicle makes and models. Americover's Automotive Carpet Cover is a 4 mil, self-adhesive protective film. Its adhesive system is water based and is specifically designed for auto and RV carpeting, and is heel pad compatible. Comes in 200 foot roll. Americover's Automotive Carpet Cover is a 4 mil, self-adhesive protective film. Its adhesive system is water based and is specifically designed for auto and RV carpeting, and is heel pad compatible. Comes in 500 foot roll.